Love this guy man! My ride or die cousin! 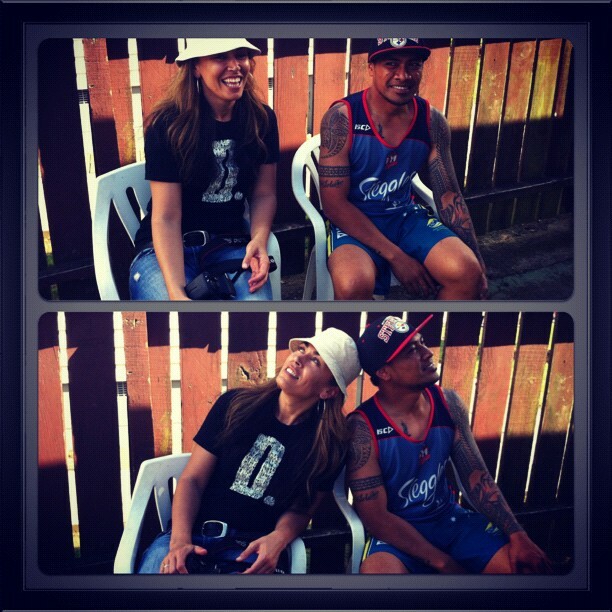 We got into all sorts of mischief when we were younger but look at us now – such responsible people lol!! I’ve been meaning to feature him in my ink series for the longest time but the first 2 sets of pics I took didn’t come out very good – both times I tried to take them we’d been on one so maybe thats why – don’t shoot & drink kids haha! Mind you I was comparing all 3 sets of pics and he’d added bits & pieces to his tattoo pieces each time so at least this set is the most up to date. I also decided to split his feature in to 2 parts. 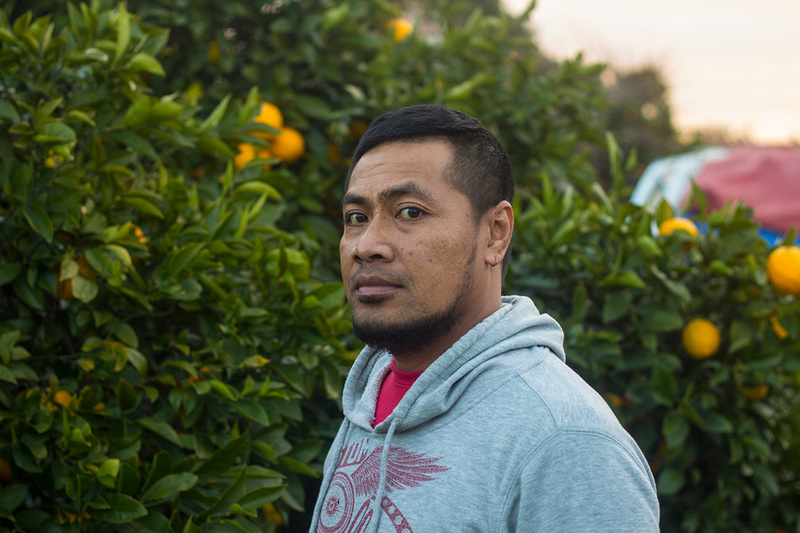 Last year he was involved in an anti family violence campaign and was featured on Seven Sharp after he told his story to the NZ Herald – both him & his wife Loris talked to me about his change and getting to the place of realising that he needed to change. Look out for part 2 coming soon. For now – Willies ink stories …. 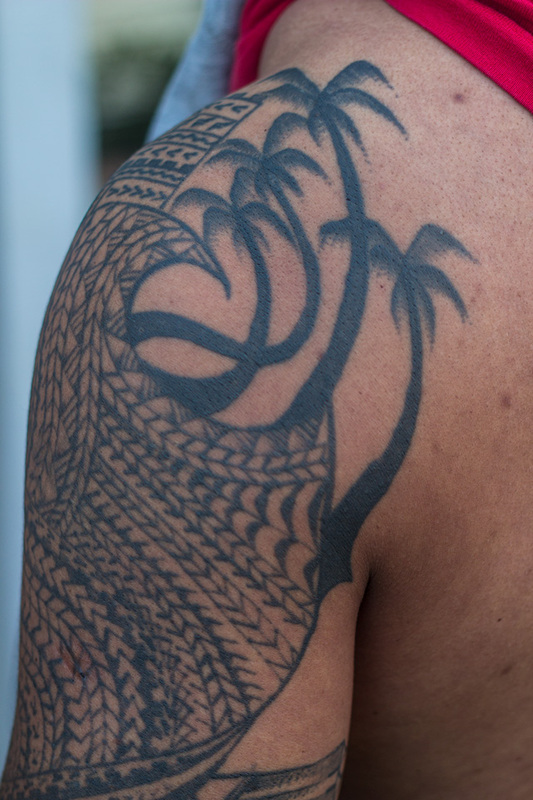 Coconut palm trees – Reminds him of where he was brought up in Samoa, there was some land near the beach that had 4 coconut trees along the front. There are only 2 left standing there now – the other 2 were cut down in a recent cyclone. You’ll notice the shape of a wave which curves round the trees too. His friend Ese designed the patterns as they went along. 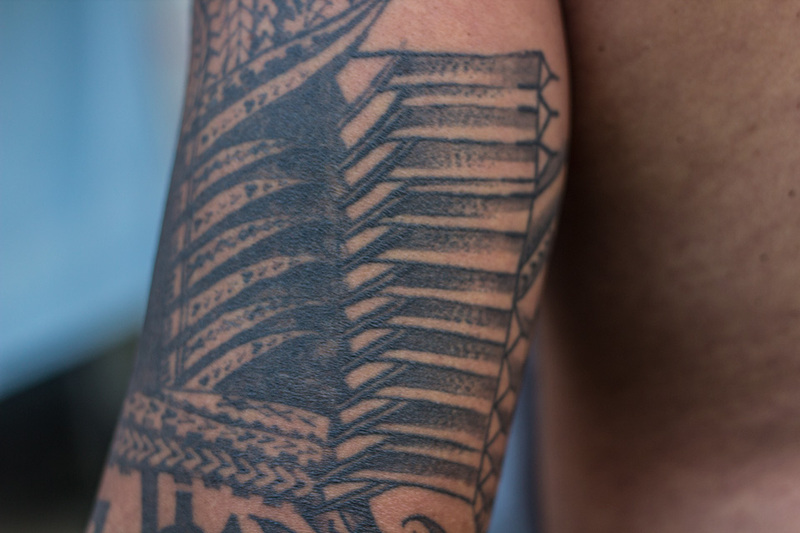 These patterns were designed & tattooed by his friend Ese. 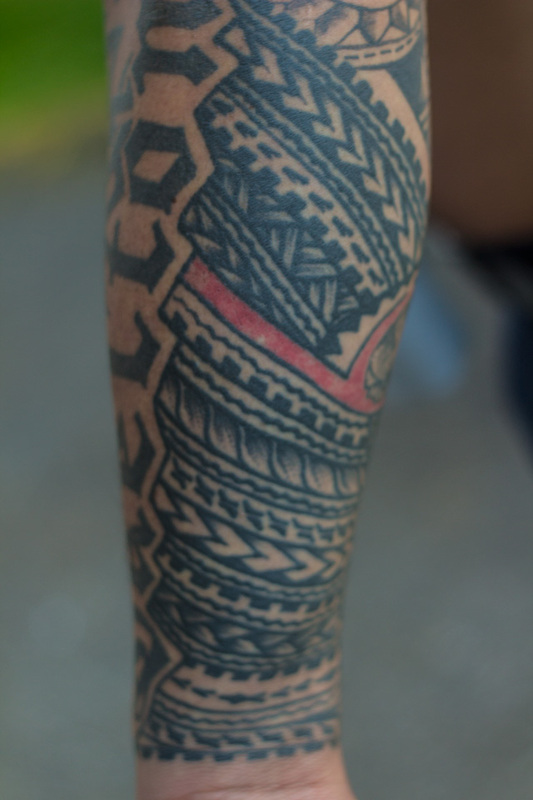 Ese took some of the patterns from his pe’a once he’d had it done and used them on Willies arm. 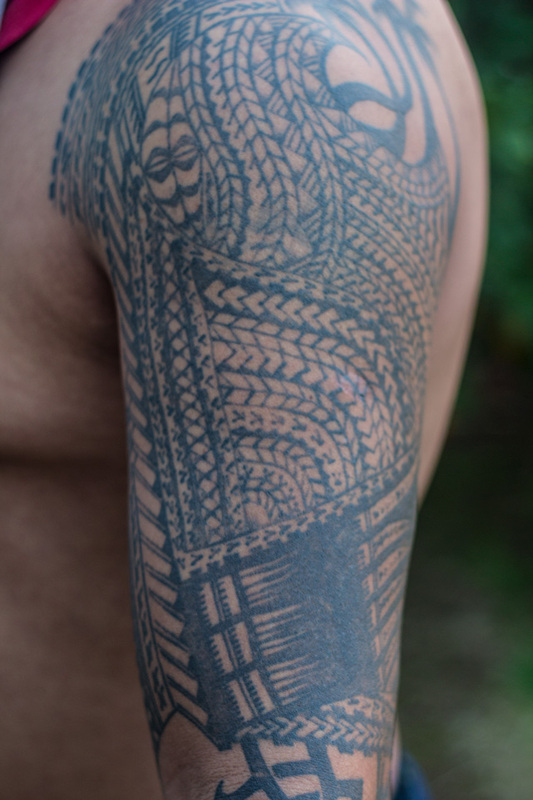 The Samoan patterns on his upper arm are all in the shape of a shell. 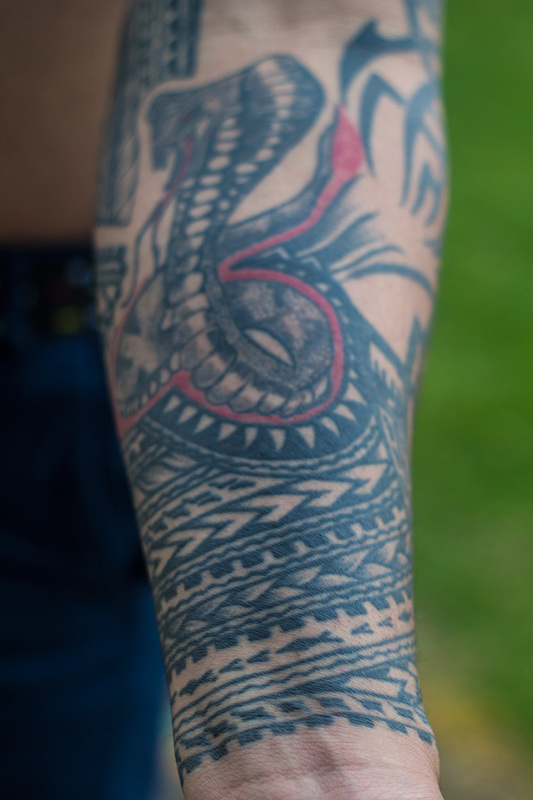 You’ll notice the difference between these patterns and the other patterns on his arm as these particular patterns were done using a home made tattoo gun. He also told me that the smaller patterns represented me, our other cousin Thomas and his best mate Loa from back when we were young, wild and free and were always coming and going. 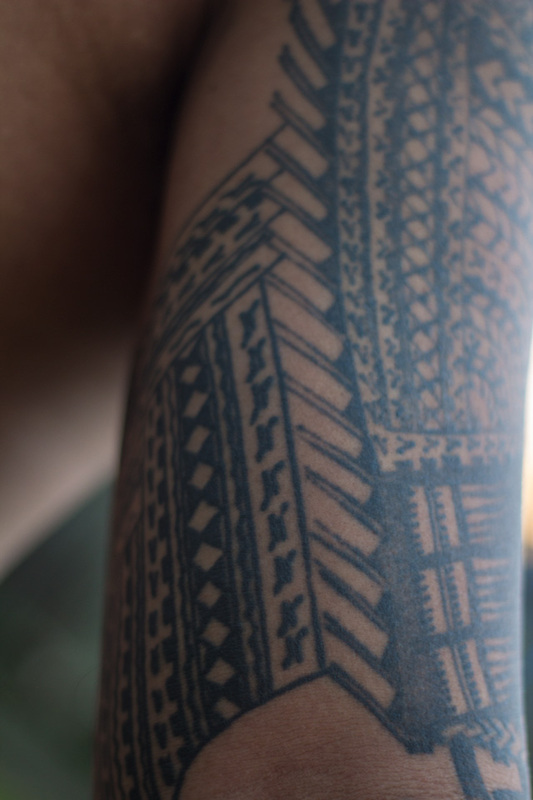 Above the lines of small patterns there are also 2 Tongan patterns towards the top which represents Loris coming into his life. Celtic patterns – Willie says the tribal celtic looking patterns show his crazy, horseyed “hey hey” days – marks & ‘W’ patterns for ‘winning’. 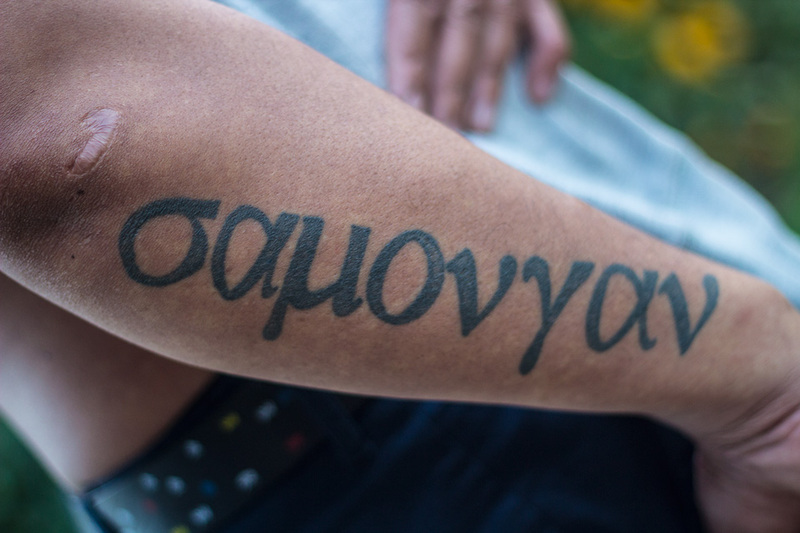 When he looks at this section of his arm he says it reminds him of how far he’s come. These were also done by Ese. 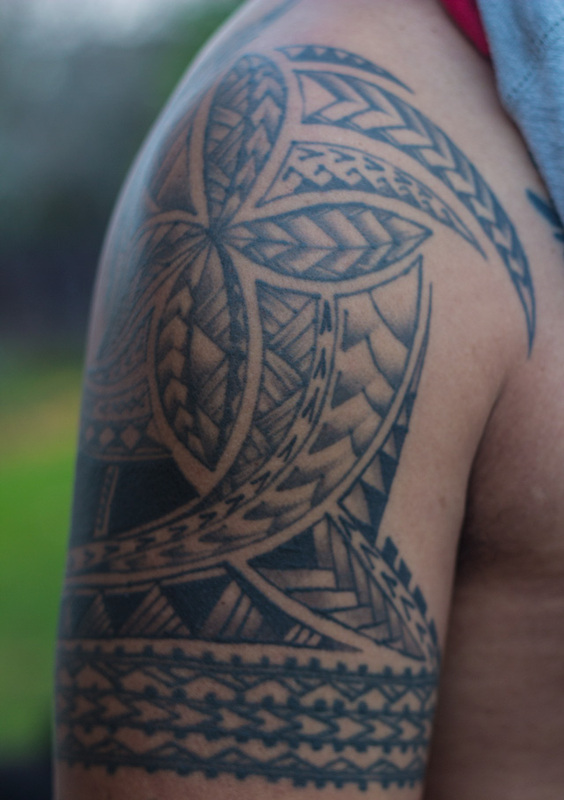 There is also a maori pattern under the tribal patterns which was done by our other cousin Thomas and symbolises Willie & his wife Loris. 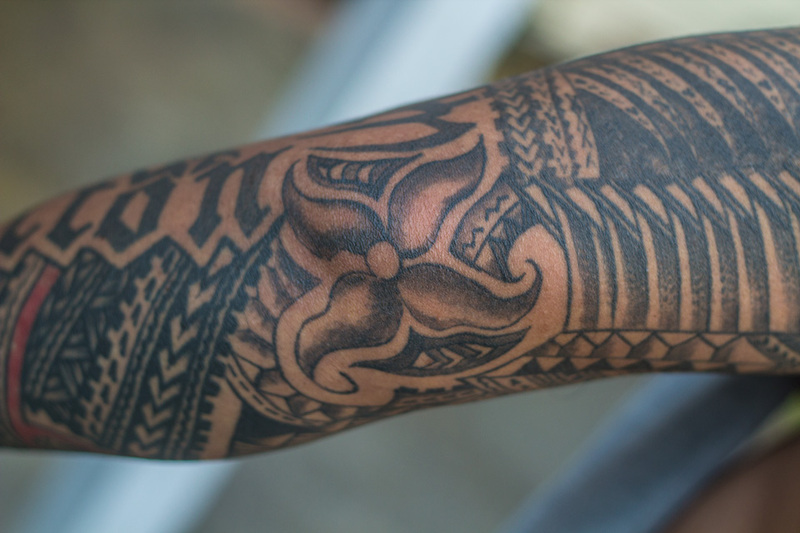 These polynesian patterns were added to Eses original piece by Thomas including the flower on Willies elbow. 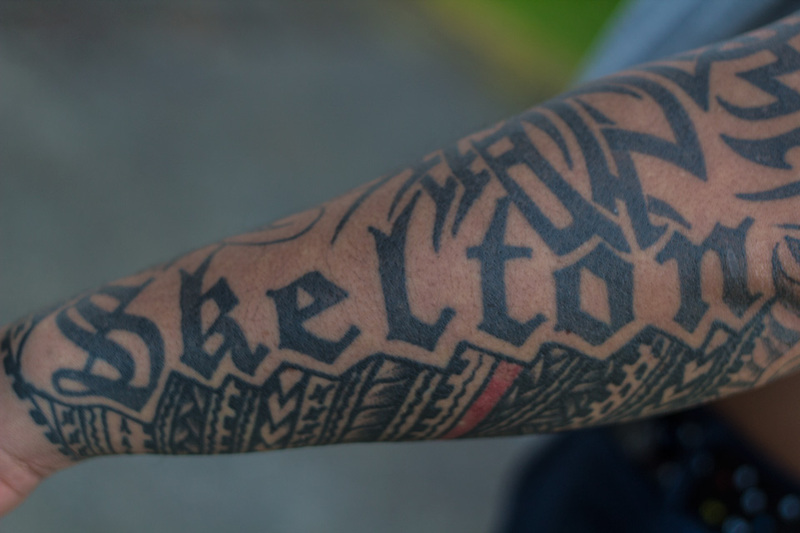 Skelton – Willies surname – represent! 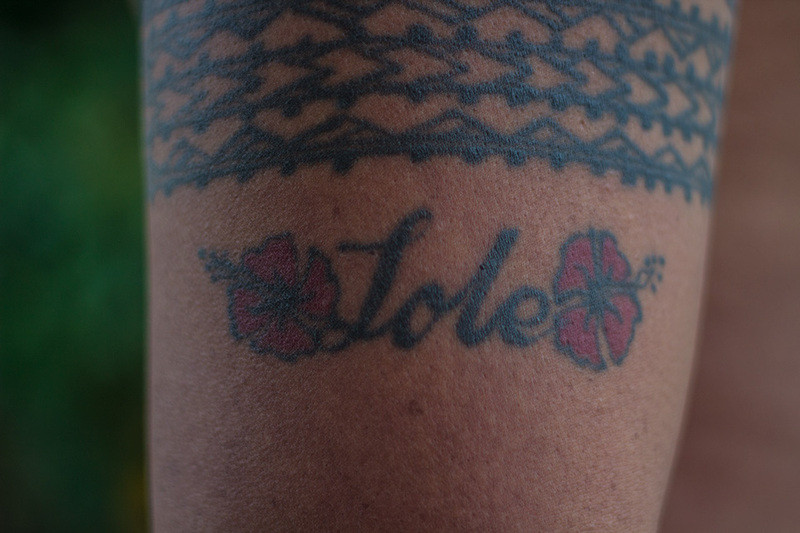 Flower – Represents Willies family. Loris (Willies wife) is the flower/centre of their family. The 3 strands on the top right is Willie (longer, bigger strand) and the 2 on the outside are his 2 daughters Frances & Leka. 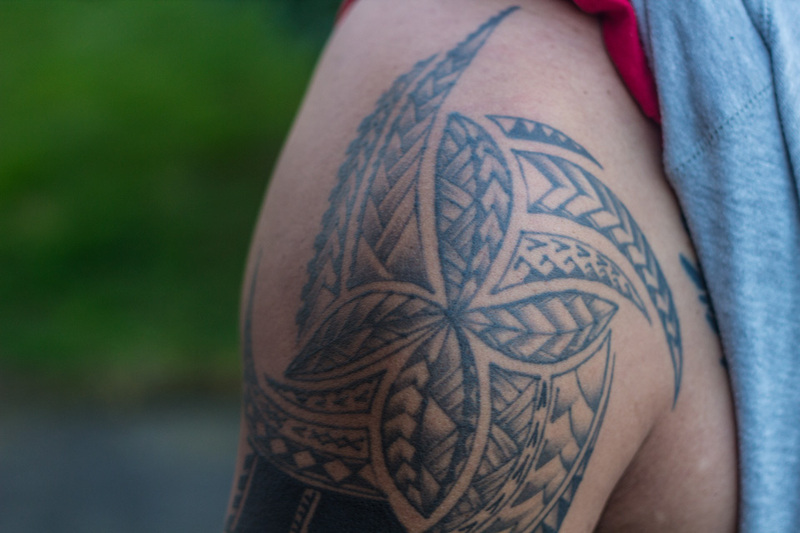 The 3 double strands around the outside of the flower represent his 3 sons Malcolm, Tomasi and Nathaniel. This was also done by his friend Ese. 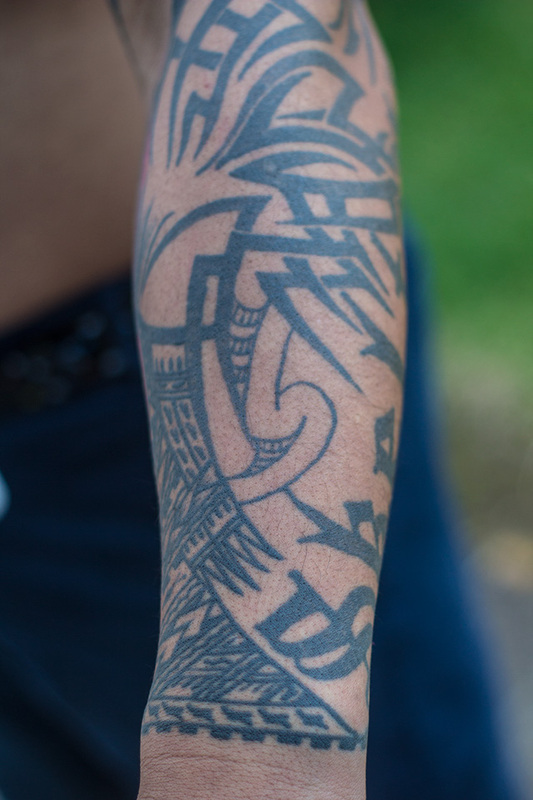 Armband/Taulima – Willies very first tattoo which was done by Suluape when he had his shop down in East Tamaki back in the day. He said he chose the pattern out of a book in the tattoo shop. Shot Willie! Thanks for sharing!